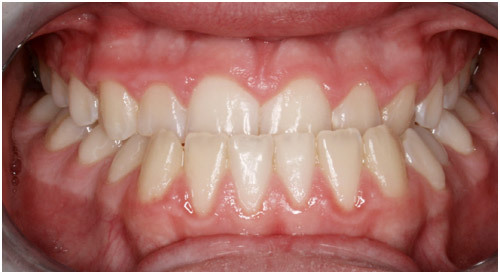 An anterior crossbite exists when one or more upper incisors bites behind the lower incisors (front teeth). These are easily corrected with routine orthodontics. An underbite exists when all the lower front teeth protrude beyond the upper front teeth. This is usually caused by a prominent lower jaw or receded upper jaw. Many patients will have a family member with a similar condition. In the past orthodontists felt these cases could not be treated unless jaw surgery or the extraction of teeth was performed. Dr. Turley has been one of the pioneers in the treatment of underbites and is recognized world-wide for his approach to treatment. What was once one of the most difficult orthodontic problems to treat has now become one of the easiest and most predictable forms of early treatment we provide. Treatment involves the child wearing an expansion appliance on the upper teeth, and a removable headgear which attaches to the expander with only 2 rubber bands. The child wears the headgear a lot the first 3-4 months, less for the next 3-4 months, and to bed only the last 3-4 months. Most children are finished with this phase of treatment after 12 months. They may receive a retainer to wear at home. Dr. Turley continues to see each child at 6 months intervals there after, until the time when they may benefit from full braces on their teeth.